When I watched 78-year-old Peruvian Nobel Prize winner Mario Vargas Llosa arrive in Venezuela to lend support to student protests of that country's dubiously elected authoritarian government, I couldn't help thinking that he's one of the most courageous intellectuals I've ever met. Vargas Llosa, who alongside late fellow Nobel Prize winner Gabriel Garcia Marquez may be Latin America's greatest literary glory of all time, could be enjoying his autumn years receiving honorary degrees from universities around the world, or rubbing elbows with international celebrities in one of his homes in New York, Madrid or Lima. What's more, he could be making many more friends - and probably selling many more books - by going along with Latin America's fashionable pseudo-progressive political thinking. He could be delighting his audiences by telling them what many want to hear - that all of Latin America's problems are caused by an evil U.S. empire - and keeping silent about the human rights violations and economic disasters in countries such as Cuba and Venezuela. Instead, Vargas Llosa not only speaks his mind, but acts accordingly. He visited Venezuela last week to participate in a conference on Freedom in Latin America organized by the independent group CEDICE, knowing that he would probably be harassed and insulted by the Venezuelan regime during his stay there. At a news conference and in several interviews there, Vargas Llosa blamed President Nicolas Maduro for Venezuela's "economic catastrophe." He pointed out that the country's inflation rate reached 57 percent last year, which may be the world's highest, and that there are growing shortages of food and other essential goods although Venezuela is one of the world's biggest oil producers. Making the most of his presence there to reach Venezuelans in a country with increasingly censored media, Vargas Llosa said Maduro is insisting on using old-fashioned socialist and populist policies that have failed everywhere. Asked about the anti-government student demonstrations that have rocked the country since February, which have left at least 41 dead and hundreds, Vargas Llosa called for the release of all political prisoners, which he said would help generate a climate for an "effective dialogue" between the government and the opposition. He also referred to Latin America's failure to condemn Maduro's bloody repression of the student protests, and the Venezuelan government's press censorship and imprisonment of opposition leaders such as Leopoldo Lopez. Countries in the region have shown a "cowardly attitude" by not denouncing the Venezuelan regime's abuses, he said. In one of my most recent interviews with Vargas Llosa, I asked what motivates him to be so politically active - often at great risk - when he could be avoiding the stress of visiting hostile places. Just before that interview, he had been subject to insults by pro-government demonstrators during a visit to Argentina. "I don't think that intellectuals should have a privileged or dominating position in public debate, but I do think that intellectuals should participate in the public debate, which is something that is happening less and less," Vargas Llosa told me in that 2012 interview. "Unfortunately, especially in open and free societies, intellectuals are turning their backs on politics, considering it a dirty, despicable, activity, which they think shouldn't contaminate creative activities," he added. "I think that's a very mistaken attitude, because if he despises politics, we will be contributing to politics becoming despicable. "It's true that many intellectuals have often been mistaken, and have supported the worse causes. We have seen intellectuals who were Nazis, intellectuals who were communists, and other who have even supported the Holocaust and massive murders of Jews," he went on. "But there have been lots of intellectuals who, on the contrary, have kept their clarity and defended freedom amid that kind of collective blindness that is political fanaticism." My opinion: While most of us in the writing profession tend to honor our most successful colleagues only after they die (as we've seen in recent days with Garcia Marquez), I felt the need to applaud Vargas Llosa here and now, while he's alive, for his courage to defend basic freedoms, and for doing it at great personal risk. Regardless of whether we agree with his stand on all issues he speaks out about, which are almost everything you can think of, he's a man of tremendous courage in a world in which - as he himself told me - most intellectuals are turning their back on politics, especially when it comes to telling inconvenient truths. As he himself says, if intellectuals despise politics, politics will become even more despicable than it is now. 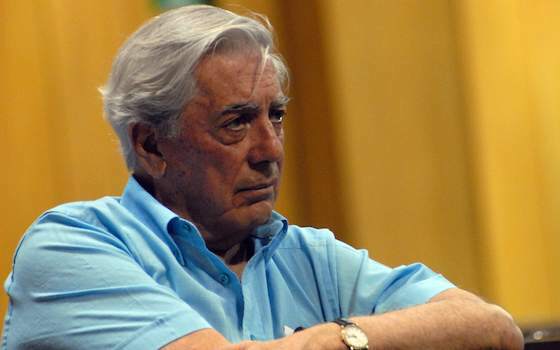 "Vargas Llosa Deserves Nobel for Courage"